A Concluding Statement describes the preliminary findings of IMF staff at the end of an official staff visit (or ‘mission’), in most cases to a member country. Missions are undertaken as part of regular (usually annual) consultations under Article IV of the IMF's Articles of Agreement, in the context of a request to use IMF resources (borrow from the IMF), as part of discussions of staff monitored programs, or as part of other staff monitoring of economic developments. The authorities have consented to the publication of this statement. The views expressed in this statement are those of the IMF staff and do not necessarily represent the views of the IMF’s Executive Board. Based on the preliminary findings of this mission, staff will prepare a report that, subject to management approval, will be presented to the IMF Executive Board for discussion and decision. 1. After sustained improvements in macroeconomic and social indicators since the turn of the century, Peru is looking ahead to the challenge of becoming a high-income nation . With average growth of over 5¼ percent since 2000, Peru has significantly reduced unemployment and poverty. Inflation is in low single digits, the fiscal position has strengthened, and dollarization has declined markedly. In the context of the commodity boom, sound macroeconomic management and structural reforms have played an essential role in this improvement. Consolidating these gains and pursuing further reforms to modernize the economy and strengthen institutions will be critical in helping Peru reach high-income status. Given the experience of other countries, care will be needed to avoid being stuck in a “middle income trap”. Importantly, even if high-income status is attainable, international experience suggests that it will take time. 2. The government has introduced several structural reforms aimed at modernizing the economy, increasing formality, and lifting potential growth through greater investment and productivity gains . These reforms intend to tackle the main inefficiencies in the economy in investment procedures, tax collection, financing costs, and labor market and social protection. They include: (i) a new institutional framework for public and public-private infrastructure investment aimed at reducing red tape; (i) improving the business climate by cutting administrative procedures and promoting the digitalization of processes; and (iii) a new tax regime for small and medium enterprises to make the current tax system more progressive, reduce compliance costs, stimulate the use of electronic means of payment and formalize the value chain. The government is also looking to modernize labor regimes and has set up a Social Protection Commission tasked with delivering a comprehensive and fiscally sustainable reform of the social security system. The aim of the latter is to increase coverage while reducing informality. 3. The current juncture is a difficult one given domestic headwinds and challenging external conditions . The Odebrecht corruption scandal that broke in December 2016 is weighing on investment and confidence. And one of the worst flooding and landslides in over 50 years (related to el Niño) has affected a significant part of the population, caused widespread infrastructure damage, and raised domestic food prices. On the external side, although commodity prices have recovered somewhat since late 2016, they remain significantly lower than during the commodity boom. There also remains significant uncertainty about the U.S. outlook and how much protectionist pressures will rise globally. 4. The authorities have reacted rapidly to the changes in domestic and external conditions. Responding to the Odebrecht scandal and floods, the Ministry of Economy and Finance has put together a plan aimed at supporting growth, including: (i) a fiscal package of 1.3 percent of GDP targeted at reconstruction needs and public investment; (ii) a relaxation in the near-term fiscal consolidation path; (iii) an exemption from healthcare contributions (nine percent of monthly wages) when employers hire new young entrants to the labor market; (iv) initiatives to support affordable housing developments, and (v) easing SMEs’ access to financing. The SBS has also given banks the ability to restructure retail debt in disaster-affected areas for up to six months without affecting borrowers’ credit ratings. To support credit conditions in an environment characterized by a slowdown in credit growth and higher international interest rates, the BCRP has reduced reserve requirements four times since December 2016. In addition, the policy rate was cut by 25 basis points for the first time in 15 months in May 2017, given a weaker inflation outlook. 5. While slowing given sizable domestic shocks, growth will remain high relative to the region in 2017 . With the current wave of copper projects reaching full capacity, the contribution of exports to economic growth is projected to decline from nearly 2½ percentage points in 2016 to just over ½ percentage point in 2017. At the same time, large infrastructure projects are being delayed in the wake of the Odebrecht scandal, and the flooding and landslides have destroyed a significant chunk of the capital stock. Nonetheless, a planned increase in government investment, combined with the announced stimulus plan and the emergency reconstruction funds, are expected to offset part of this decline, with the government contribution to growth increasing by nearly 1 percentage point. Overall, growth is expected to decline to about 2.7 percent in 2017. Inflation should gradually return to the target range as weather-related factors abate and food inflation declines. 6. After a bounceback in 2018–19, growth is projected to converge to its potential of 3¾ percent in the medium term, while the fiscal deficit narrows . The near-term growth bounceback is predicated on reconstruction spending and public investment projects, underpinned by the fiscal stimulus plan. There would also be a recovery in private sector investment in part reflecting a catch-up effect of projects delayed by the Odebrecht scandal and other factors. With the output gap closing by 2021, growth is projected to return to the potential growth rate, while the government accelerates its consolidation towards the (one percent deficit) target in the fiscal rule. 7. Risks are tilted to the downside in 2017 but there is some upside potential in the medium term . Downside risks stem from additional delays in executing investment projects, larger than expected flood-related damages, a faster rise in international interest rates, and global spillovers from a rise in protectionism or a slowdown in China. On the upside, structural reforms could proceed at a faster pace if the authorities’ reform program gains greater traction than assumed in the baseline (e.g., if the recommendations of the Social Protection Commission lead to meaningful labor market reform). Some new mining projects could come also onstream in the medium term, and higher infrastructure spending in systemically important countries could push up commodity prices. These upsides could have a sizable impact on productivity, increasing potential growth to 4-4.5 percent. 8. In the context of domestic headwinds and challenging external conditions, a combination of countercyclical policies and structural reforms is appropriate . In the short term, agile fiscal and monetary policies will help the economy meet reconstruction needs, while preserving Peru’s strong fiscal and inflation anchors. Structural reforms constitute an essential complement to these short-term actions, as lifting potential growth hinges on efforts aimed at closing infrastructure gaps, diversifying the production base, reducing economic informality, deepening financial intermediation, and improving governance, including by fighting corruption and strengthening institutions. 9. A moderate and temporary fiscal loosening is justified at the current juncture . Due to prudent fiscal policy in the past and low net public debt, the government has ample fiscal space to address flood-related reconstruction needs. The fiscal stimulus plan is also appropriate given the existing output gap and the expected deterioration in domestic demand. However, the success of this plan depends on executing a high level of investment spending, which has historically proven to be difficult in Peru. In this regard, staff welcomes recent government efforts to raise execution rates, including by effecting annual transfers to subnational governments earlier in the year (by the end of the first quarter). Over the medium term, the credibility of the fiscal strategy will depend on converging back to the original deficit target of one percent. 10. The move away from a structural balance rule has advantages as well as challenges . Cross-country experience with structural deficit rules has been mixed. For sure, headline deficit targets are more transparent and easy to communicate. Moreover, the new rule maintains key checks and balances embedded in the previous rule to ensure that fiscal policy is conducted responsibly (e.g. the Fiscal Council), even as it is still informed by structural balance trends and contains appropriate escape clauses. The latter have been appropriately called upon currently to finance reconstruction needs. Headline deficit targets are challenging though, as they require a sustained effort to broaden the tax base and avoid recourse to procyclical spending measures. Avoiding increasing spending rigidities more generally is also recommended to help facilitate the medium-term fiscal consolidation. 11. Staff agrees on the infrastructure needs and recommends continued efforts to improve revenue collection . Regarding infrastructure gaps, the quality of infrastructure compares unfavorably with that of trade competitors and the government’s focus on this is welcome, including by reforming the system of public investment (creating Invierte.pe). Staff recommends also keeping a focus on enhancing capacity to implement projects at the sub-national level and raising the tax to GDP ratio. Reflecting lower commodity revenues, the latter has fallen to a low of around 14 percent of GDP and is below the regional average. 12. Staff welcomes the authorities’ plan to establish a medium-term budgeting framework (MTBF) and suggests complementing this by improving the PPP framework and introducing a comprehensive approach to monitoring fiscal risks . An MTBF should improve consistency between the annual budget and macro-fiscal aggregates, enhancing fiscal discipline, costing of policies, and predictability of the budget process. Good examples include, Australia, Canada, Sweden and the UK. Regarding PPPs, Peru’s framework is considered relatively good by international standards and efforts to enhance capacity at Proinversión are welcome. There is scope, however, to improve certain facets, for example the procurement phase given a high level of contract renegotiations and cost overruns. In line with previous IMF technical assistance, staff also recommends publishing an annual comprehensive fiscal risks statement, covering contingent liabilities and risks associated with investment plans. This is especially important given the objective of ramping up infrastructure spending. 13. The next monetary policy steps need to be considered carefully and communication will be key . With the output gap widening, temporary weather-related price pressures expected to abate quickly, and core inflation remaining within the target range, staff supports the BCRP’s recent reduction of the policy rate. Looking ahead, fiscal policy has the advantage of facilitating both a demand and supply response (e.g. reconstruction of housing and infrastructure). Given the availability of fiscal space, this suggests fiscal policy should be the first line of defense if flood damage turns out to be higher than expected. Monetary policy can provide a useful complement if demand conditions deteriorate further, but the BCRP will need to continue to remain data dependent and monitor inflation expectations closely for any signs of a persistent drift above the target range. Regarding local currency reserve requirements, future changes should be clearly tied to the credit cycle. Clear communication regarding the temporary nature of existing price shocks and the inflation outlook will be essential to continue anchoring inflation expectations. 14. Increased exchange rate flexibility and the unwinding of the BCRP’s FX intervention instruments have been important steps . Peru’s external position is assessed to be broadly consistent with fundamentals and appropriate policy settings. Going forward, exchange rate flexibility remains important as demonstrated by the increased resilience of domestic demand in Latin America to recent current account adjustment under flexible exchange rate regimes. And the recent declines in credit dollarization help limit the adverse impact (via balance sheet effects) of exchange rate movements on domestic demand and financial sector soundness. Staff welcomes the smooth unwinding of the BCRP’s FX swaps and its beneficial impact in terms of fostering a market-determined exchange rate. Future FX interventions should be limited to cases of disorderly market conditions. This will also help further develop hedging markets. a. Consolidating dedollarization gains . While measures already in train should still have a marginal impact (e.g. targets on banks’ share of dollar loans), another potential measure could be increasing FX provisions for FX loans to unhedged borrowers. b. Establishing a financial stability council. This could formalize the regular meetings between the BCRP, MEF, and SBS, while maintaining the mandates and operational autonomy for the individual agencies. While there is no one-size-fits-all, and there are various models to achieve this (e.g. New Zealand, the U.K, and Germany), key features include a clear mandate that sets out well-defined objectives, strong accountability, and mechanisms to foster cooperation among agencies. A coordinated council would help to raise awareness about potential risks, facilitate consensus building, and identify overlaps and gaps in monitoring vulnerabilities. c. Broadening the regulatory and supervisory perimeter. The rapid expansion of the financial cooperatives sector needs to be carefully monitored, as several cooperatives have grown to be as big as the small banks in the system. Bringing the larger cooperatives under direct SBS supervision would be desirable. d. Developing a national house price index. The property sector has grown rapidly, though there has been some price moderation recently and indicators for Lima do not suggest overheating. Staff welcome the additional steps the BCRP is taking to create an index that includes other major cities. This would allow a more comprehensive assessment of risks. 17. Perhaps the biggest challenges (and rewards) are associated with financial deepening and inclusion . Tremendous progress has been made in branch penetration, which quadrupled over the last decade. But overall financial depth remains low, relative to fundamentals and the region. Financial inclusion is also low—the Global Findex (2014) shows that only about 30 percent of the Peruvian population aged over 15 has a bank account, below regional (51 percent) and income peers (58 percent). Notwithstanding recent reforms in the stock market, capital markets lack depth and liquidity. While there are no quick fixes, private initiatives to develop mobile payment platforms ( Billetera Móvil) are welcome. Further efforts to reduce informality and increase literacy and financial education will be important. 18. A multi-pronged approach is needed to increase potential growth, especially in the context of lower commodity prices . The 2016–17 Global Competitiveness Report (GCR) suggests that Peru is more competitive relative to other Latin American countries, but lagging trade rivals and OECD countries in many areas. Key areas for improvement in the journey to high-income status include education, infrastructure, innovation, and institutions. And the government is focusing on many of these areas as well as pursuing reforms to reduce informality. A comprehensive package—including making labor regulations significantly more flexible and ensuring labor costs grow in line with productivity—will likely be necessary to decisively dent informality. The Social Protection Commission has an important mandate in this regard. 19. The Odebrecht case has underscored the problem of corruption. The government has undertaken steps to address this issue, including extending bans for corrupt public officials, designating a special investigative team focused solely on the Odebrecht case, and barring any company that has admitted/been convicted of corruption from new bids on government projects as well as ringfencing their assets in Peru. But additional anti-corruption measures will likely be needed, including strengthening the anti-corruption legal framework and institutions and adopting international best practices for the Office of the Comptroller General. Effective implementation of anti-money laundering measures in line with the international standards, for example enhanced due diligence for politically exposed persons, would also help to prevent the misuse of the financial system by corrupt officials. We would like to take this opportunity to thank the Peruvian authorities and private sector representatives for their hospitality and open and constructive dialogue. Calculated as the probability that all seven banks are simultaneously in distress, where distress is defined as unexpected losses exceeding 7.5 percent of capital. WHAT is the point of buying shares? Ultimately investors must hope that the cash they receive from the company will offer an attractive long-term return. Over the long run, reinvested dividends rather than capital gains have comprised the vast bulk of returns. But since the 1980s American firms have increasingly used share buy-backs, which have tax advantages for some investors. Buy-backs have been higher than dividend payments in eight of the past ten years. In a buy-back, investors receive cash for a proportion of their holdings. A new paper* in the Financial Analysts Journal argues that adding this to dividend receipts to calculate a total payout yield gives a better estimate of future returns than the dividend yield alone. It also reveals a much better match between stockmarket performance and overall economic growth. Using data going back to 1871, the authors find that the average dividend yield has been 4.5% and the total payout yield 4.89%. Since 1970 the dividend yield has dropped to 3.03%, but the total payout yield has averaged 4.26%. Looked at on that basis, the overall income return from shares has been not that far below historical levels. Over the long run, changes in valuation levels do not make much difference to the return. 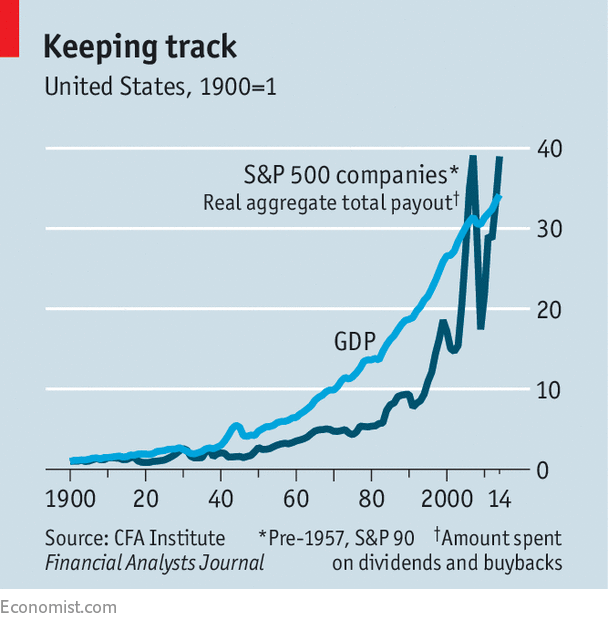 What has driven stockmarket returns in recent decades is that total payouts have grown faster than before. The growth rate since 1871 has been 2.05%; since 1970, it has been 3.44%. That is probably because of strong corporate profits, which recently hit a post-1945 high as a proportion of America’s GDP. An obvious apparent difference between dividends and buy-backs is that every shareholder gets the dividend but not all of them tend to take part in a buy-back. But theory suggests investors should gain from a share buy-back even if they do not take part. The buy-back will reduce the number of shares in issue, giving existing investors a proportionately larger claim on the profits and assets of the company. Over time, buy-backs are offset by the shares companies issue to make acquisitions and honour executive share-option schemes. In the half century since 1970 new share issuance has exceeded buy-backs. But in the ten years to 2014, on average, buy-backs have predominated. The authors also experiment with using the total payout yield as a yardstick of whether stocks are dear or cheap. By averaging the yield over ten years, they work out the cyclically-adjusted total yield (CATY) and compare it with the cyclically-adjusted price-earnings ratio (CAPE), which averages corporate profits. They find that CATY is at least as good as CAPE in predicting market movements. As for the link with economic growth, it is often hard to find a short-term correlation between this and stockmarket performance, which tends to be much more volatile. But the authors found that, over the very long run, growth in the aggregate payout from American equities has matched that of the country’s GDP (see chart), and payout-per-share growth has matched that of GDP per head. There is no guarantee that this relationship will continue. Payouts lagged a long way behind GDP in the second half of the 20th century, and have only caught up because of the surge in buy-backs. And the stockmarket is much more international than it used to be; almost half the revenues of S&P 500 companies come from outside America. Focusing on total payouts allows the authors to be a bit more optimistic in their forecasts of future returns than the traditional dividend-based approach would suggest. Historically, total payouts have grown by around 1.67% per year, compared with 1.46% for dividends alone. Combine that with the current payout yield and you get an expected future real return of 5.1%, compared with just 3.6% if dividends alone are used. Whether even that return, however, would be enough to meet defined-benefit pension promises, particularly those made to their workers by state and local governments in America, is another question. These titans—Alphabet (Google’s parent company), Amazon, Apple, Facebook and Microsoft—look unstoppable. They are the five most valuable listed firms in the world. Their profits are surging: they collectively racked up over $25bn in net profit in the first quarter of 2017. Amazon captures half of all dollars spent online in America. Google and Facebook accounted for almost all the revenue growth in digital advertising in America last year. 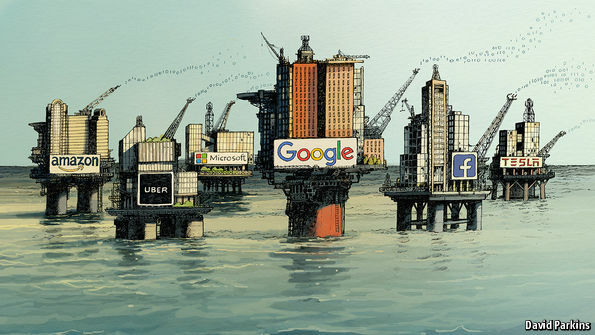 Such dominance has prompted calls for the tech giants to be broken up, as Standard Oil was in the early 20th century. This newspaper has argued against such drastic action in the past. 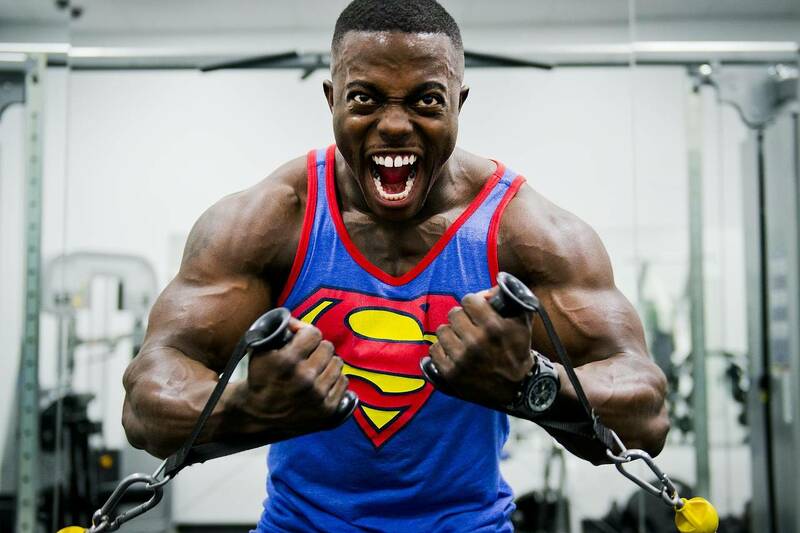 Size alone is not a crime. The giants’ success has benefited consumers. Few want to live without Google’s search engine, Amazon’s one-day delivery or Facebook’s newsfeed. Nor do these firms raise the alarm when standard antitrust tests are applied. Far from gouging consumers, many of their services are free (users pay, in effect, by handing over yet more data). Take account of offline rivals, and their market shares look less worrying. And the emergence of upstarts like Snapchat suggests that new entrants can still make waves. But there is cause for concern. Internet companies’ control of data gives them enormous power. Old ways of thinking about competition, devised in the era of oil, look outdated in what has come to be called the “data economy”. A new approach is needed. What has changed? Smartphones and the internet have made data abundant, ubiquitous and far more valuable. Whether you are going for a run, watching TV or even just sitting in traffic, virtually every activity creates a digital trace—more raw material for the data distilleries. As devices from watches to cars connect to the internet, the volume is increasing: some estimate that a self-driving car will generate 100 gigabytes per second. Meanwhile, artificial-intelligence (AI) techniques such as machine learning extract more value from data. Algorithms can predict when a customer is ready to buy, a jet-engine needs servicing or a person is at risk of a disease. Industrial giants such as GE and Siemens now sell themselves as data firms. This abundance of data changes the nature of competition. Technology giants have always benefited from network effects: the more users Facebook signs up, the more attractive signing up becomes for others. With data there are extra network effects. By collecting more data, a firm has more scope to improve its products, which attracts more users, generating even more data, and so on. The more data Tesla gathers from its self-driving cars, the better it can make them at driving themselves—part of the reason the firm, which sold only 25,000 cars in the first quarter, is now worth more than GM, which sold 2.3m. Vast pools of data can thus act as protective moats. Access to data also protects companies from rivals in another way. The case for being sanguine about competition in the tech industry rests on the potential for incumbents to be blindsided by a startup in a garage or an unexpected technological shift. But both are less likely in the data age. The giants’ surveillance systems span the entire economy: Google can see what people search for, Facebook what they share, Amazon what they buy. They own app stores and operating systems, and rent out computing power to startups. They have a “God’s eye view” of activities in their own markets and beyond. They can see when a new product or service gains traction, allowing them to copy it or simply buy the upstart before it becomes too great a threat. Many think Facebook’s $22bn purchase in 2014 of WhatsApp, a messaging app with fewer than 60 employees, falls into this category of “shoot-out acquisitions” that eliminate potential rivals. By providing barriers to entry and early-warning systems, data can stifle competition. Who ya gonna call, trustbusters? The nature of data makes the antitrust remedies of the past less useful. Breaking up a firm like Google into five Googlets would not stop network effects from reasserting themselves: in time, one of them would become dominant again. A radical rethink is required—and as the outlines of a new approach start to become apparent, two ideas stand out. The first is that antitrust authorities need to move from the industrial era into the 21st century. When considering a merger, for example, they have traditionally used size to determine when to intervene. They now need to take into account the extent of firms’ data assets when assessing the impact of deals. The purchase price could also be a signal that an incumbent is buying a nascent threat. On these measures, Facebook’s willingness to pay so much for WhatsApp, which had no revenue to speak of, would have raised red flags. Trustbusters must also become more data-savvy in their analysis of market dynamics, for example by using simulations to hunt for algorithms colluding over prices or to determine how best to promote competition. The second principle is to loosen the grip that providers of online services have over data and give more control to those who supply them. More transparency would help: companies could be forced to reveal to consumers what information they hold and how much money they make from it. Governments could encourage the emergence of new services by opening up more of their own data vaults or managing crucial parts of the data economy as public infrastructure, as India does with its digital-identity system, Aadhaar. They could also mandate the sharing of certain kinds of data, with users’ consent—an approach Europe is taking in financial services by requiring banks to make customers’ data accessible to third parties. After a bout of volatility, stocks have jolted back to life but charts suggest that the yield curve bears watching. On May 17th, the stock market shed about 2% to log its worst drop since the election. Jitters over the FBI investigation of President Donald Trump gave bears an excuse to sell, although it was not a long-lived panic. While the CBOE volatility index (VIX) scored one of its biggest percentage increases in history, the sell-off lasted exactly one day. And considering that it happened just one day after the Standard & Poor’s 500 reached an all-time high on an intraday basis, the fear clearly was overblown. The S&P 500, Nasdaq and broad-based Wilshire 5000 all touched all-time highs last week. But more importantly, breadth indicators scored a few positive chart events to tell us the bull market is still alive and kicking. The New York Stock Exchange advance-decline line, which keeps a running tab of NYSE stocks that go up each day minus those that go down, scored another record high and even broke out to the upside from a one-month trading range. If we look at the volume changing hands on these advancing and declining stocks we get further encouragement. 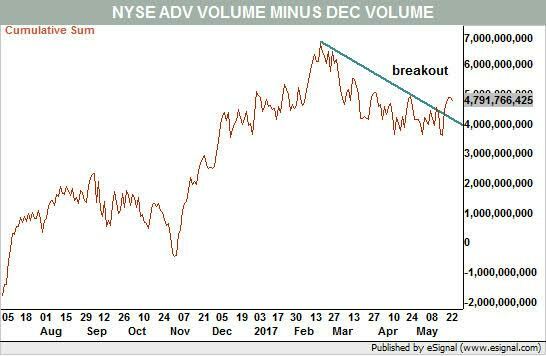 The NYSE advancing volume minus declining volume line broke out to the upside from a three-month slide (see Chart 1). What this means is the stocks that go up are getting more volume than stocks that are going down and, of course, that leans bullish. Buyers are more aggressive than sellers – the hallmark of a bullish market. There is more to like in the volume area as major market exchange-traded funds (ETFs) finally saw a positive change in their on-balance volume charts. This indicator keeps track of daily volume on up days minus volume on down days. 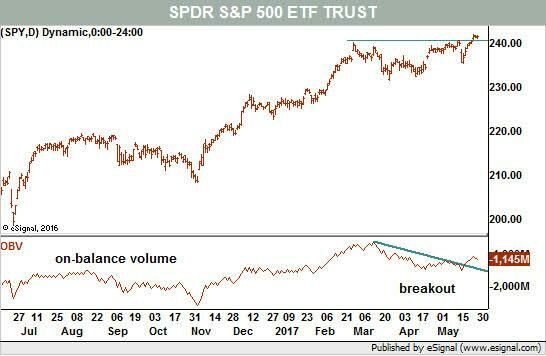 For example, on-balance volume on the SPDR S&P 500 ETF (ticker: SPY) started to fall in early March and continued lower until the May 17 market slide. The next day it started to rise and has now broken through the trendline that guided it lower for the past two months (see Chart 2). That suggests money is finally flowing back into the ETF, confirming the new highs in price. We can see the same breakout in the on-balance volume of the SPDR Dow Jones Industrial Average ETF TrustDIA in Your Value Your Change Short position (DIA). The iShares Russell 2000 (IWM) does not show a trend break in in the indicator but it did reach its highest levels of the year. That’s even better. New highs in several major indexes, rising breadth and positive money flows into index ETFs together paint a rather strong picture for stocks. However – and there always is a however – the bond market does offer a warning. 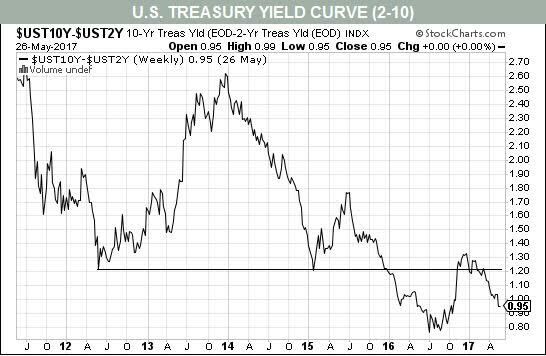 One year ago, I started watching the yield curve more closely as it sounded a warning for the economy. At that time, the curve started to flatten as the spread between the 10-year Treasury yield and the 2-year Treasury yield got tight. It was not quite as flat, and certainly not upside-down, as the yield curve we often see as a precursor to recession but it seemed to be on its way. The spread bottomed in August and really started to climb after the election, when hopes for tax reform and an upswing in hiring were fresh. A steepening curve often begins when the economy is starting to warm up. Unfortunately, that trend reversed and the yield curve is now flatter than it was before the election (see Chart 3). While the stock market has gotten its act back together, investors should keep an eye on the yield curve. The bond market seems worried about dysfunction in Washington putting the kibosh on such desired initiatives as tax reform. If they look to be in trouble, the stock market could be vulnerable. Why Did Trump Accept Venezuela’s Money? CAMBRIDGE – There is a certain irony in recent news that Venezuela donated a half-million dollars to Donald Trump’s presidential inauguration through Petróleos de Venezuela (PDVSA), the state-owned oil company. Venezuela, of course, is a serial defaulter, having done so more times than almost any other country over the last two centuries. It is not exactly clear why Venezuelan President Nicolás Maduro is so desperate to avoid defaulting on the country’s foreign debt that he is starving his own people, much the way Romanian dictator Nicolae Ceauşescu did in the 1980s. With such severe shortages of food and basic medicines, there is little doubt that if and when the autocrat is finally deposed, there will be some eerily familiar horror stories. It is simplistic to portray the Venezuelan tragedy as an apocryphal tale of what happens when a country is taken over by left-wing populists. The right-wing governments of the 1980s and 1990s were also corrupt; and, while national income rose, income distribution was among the most unequal in the world. But it is true that Venezuela’s current horror show is very much a product of two decades of left-wing misgovernment. There was a time when a contribution such as the one Venezuela made to Trump was a mere pittance in a much larger aid budget. Under its previous president, the charismatic Hugo Chávez, Venezuela spread its oil money far and wide, mostly to support other populist anti-American governments in the region. Chávez even funded heating fuel for some low-income households in the US, a program made famous by former US representative Joe Kennedy II’s 2006 television ads. That was back when high and rising oil prices helped to maintain Venezuela’s revenues even as economic mismanagement sent oil production into a downward spiral. Mind you, Venezuela was never nearly as rich as the US, so its aid budget was like giving to the poor by taking from the almost poor. Now, with oil prices having fallen dramatically since Chávez’s death from cancer in 2013, his successor, who has all the charisma of a lifelong apparatchik, is being forced to get by without the same easy revenues. And while Chávez was also autocratic, he probably won his elections. Maduro’s election in 2013, by contrast, was a very close affair that many people question; for one thing, the opposition was allowed virtually no television time, even if starry-eyed US academics insisted that Maduro won fair and square. It is understandable that left-leaning scholars found some of the socialist government’s redistribution and education policies appealing, as Nobel laureate Joseph Stiglitz did when visiting Caracas, the country’s capital, in 2007. But the left’s willingness to overlook the dismantling of democratic institutions in Venezuela is more reminiscent of right-leaning Chicago-school economists’ relationships with Latin American dictators in the 1970s. Today, Venezuela’s economy is a full-blown disaster, with the collapse in growth and near-hyperinflation causing widespread human suffering. In such circumstances, one might expect a traditional Latin American military coup. The absence of one in Venezuela is hardly a reflection of strong democratic institutions. Rather, the government gives the military a free hand in running the drug trade, making many generals and officials extremely rich – and able to buy the loyalty of key troops. And this brings us back to the bizarre spectacle of this economically desperate country helping to fund Trump’s inauguration festivities. Like Joe Kennedy II, the Trump organizers can plead that if Venezuela wants to spend its money on making life better for its much richer northern neighbor, who are they to say no? Well, in both cases, the US should have said no: while the aid is transparent, the symbolism of a rich country taking money from a poor neighbor with millions of suffering people is hardly attractive. And it is particularly bizarre that even as US policy toward Mexico has greatly increased the chances of an anti-American Chávez-type character becoming president there, officials are providing positive publicity to a government that is a caricature of disastrous governance. Trump’s predecessor, Barack Obama, took a principled stand in US dealings with Venezuela, imposing sanctions to rein in rogue behavior, a policy that drew broad bipartisan support. The Trump administration needs to stay the course, especially as lower oil prices have weakened the Venezuelan government’s hand. Instead of bashing Latin America, the US needs to show it can be a steady and principled friend that will not be swayed by corrupt bribes of any type.